The Brits have always had a cheeky sense of humor that I thoroughly enjoy & I am happy to report that it is still merrily in tact. While perusing the many wonderful items in the fifth floor market at Harvey Nichols I encountered these & could not help but laugh! 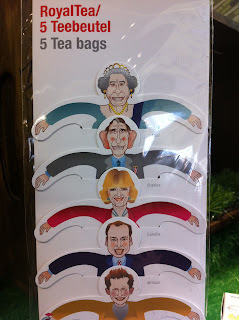 These hilarious tea bags afford any commoner the opportunity to have tea with Royalty. Simply fill your cup with hot water and drop in the Royal of your choosing!